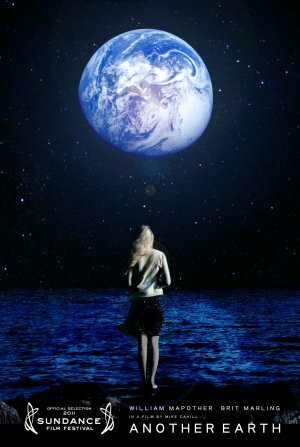 Another Earth, directed by Mike Cahill and written by Cahill and Brit Marling, is an unusual type of science fantasy film, one that is mostly concerned with human relationships rather than with telling an adventure story. Rhoda (Brit Marling) is a teenager who has just been accepted into M.I.T. However, she gets into a drunk driving accident in which she hits a car with a family in it, killing a mother and her son. After spending time in prison, she is released. She gets a job working as a janitor at a high school. She goes to the house of the father who survived the crash, John (William Mapother) to apologize. He doesn’t recognize her, because he was in a coma at the time of her trial. She can’t bring herself to apologize, so instead she makes up a story about looking for work as a maid. He hires her, and she begins going to his house every week to clean, still unable to bring herself to tell him the truth. Eventually, they become romantically involved. At the same time this is going on, a previously unknown planet appears in the sky. It looks like the Earth, and it turns out to be an exact replica of this planet. Fascinated with the idea of meeting another version of herself, Rhoda enters a contest for people who wish to travel to this second Earth. Now and then there are voiceovers discussing the philosophical implications of a second Earth. I mostly liked this film. The relationship between Rhoda and John develops in a believable manner. The scenes with an Earth in the sky have an eerie beauty to them. And I liked Brit Marling’s performance as Rhoda. However, the philosophizing gets woozy at times; the movie would have been better without it. And there is a subplot about one of Rhoda’s fellow janitors deliberately blinding himself that doesn’t really work. A flawed but nonetheless enjoyable film. This entry was posted on September 10, 2011 at 6:17 am and is filed under Cinema. You can follow any responses to this entry through the RSS 2.0 feed. You can leave a response, or trackback from your own site.